Whether it is a fizzy drink, fruit concoction or a powdered juice, summer brings with it a barrage of advertising from the cold beverages stable, and this year is no different. What stands out, however, is the yin-yang phenomenon that is presently noticeable in the Rs 1,000-1,200 crore branded juice segment, thanks to one brand that is swimming against the category. 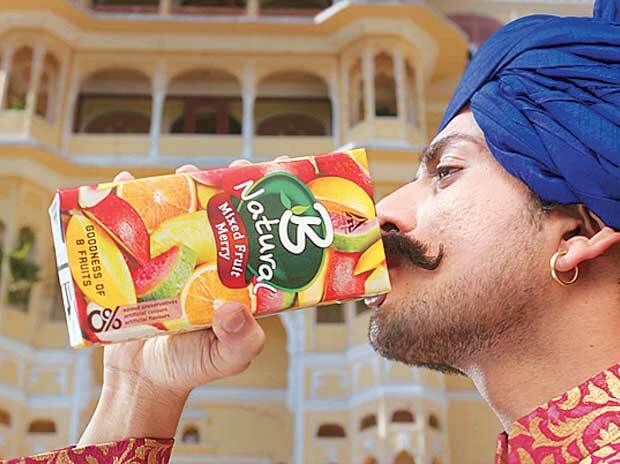 ITC entered the branded juice market with B Natural, the fruit juice brand it acquired a year back from south-based Balan Natural Food, and recently broke its first ever advertising campaign post acquisition. While the two dominant players in the category - Dabur's Real and Real Activ (55 per cent market share) and PepsiCo's Tropicana (30 per cent market share) - have captured the healthy/fresh fruit positioning, ITC has explicitly focused on a disparate plank for B Natural's launch: taste. The reason? "Every fruit drink has the inherent goodness of fruit, which is a base level expectation of every consumer. Great taste, however, is a differentiator," explains Sandeep Shivaram Upadhyaya, marketing manager, new categories, foods division, ITC. B Natural, therefore, has seven flavours to bolster its taste premise. While the new packaging and product was rolled out in the South in January, 2015, it has now been taken to other regions. A TV commercial crafted by Grey Group shows a central character, Sangram Singh, as a stern palace guard who has never displayed emotion, but on consumption of B Natural, he spontaneously and unabashedly displays expressions to demonstrate that he is enamoured by its taste. 'Can't hide the taste' is the rather self-explanatory baseline that the brand has stuck to. The commercial, which has been dubbed in regional languages and is supported by press, radio and digital advertising, targets the SEC AB segment. The brand wants to rope in the everyday consumer who is concerned about his health, but is not fanatical about it. B Natural's launch communication has three primary deliverables: a simple brand story, conveyed with a singularity of messaging (taste) and be noticed. An initial marketing budget of Rs 5-10 crore has been allocated for B Natural, according to sources. Fruit juice consumption in India is still driven largely by in-home consumption at unbranded fruit juice stalls. The packaged, branded juice market is nascent unlike the West, and category penetration is a low 5 per cent, growing at a CAGR of 8-9 per cent. The lack of awareness has been a key issue, but increasing health and hygiene awareness is playing a role in propelling the category. "There is literally a fruit iceberg under us, as the category is poised to explode," says Ram Jayaraman, executive creative director, Grey Bengaluru. The brand has taken quite a risk though, in a low-awareness category, by ignoring the health parameter for an otherwise generic quality as taste. But ITC is of the opinion that while quality needs to be communicated, the plank of health is a given when one talks of fruits. And a typical Indian will anyway never give up taste for what he perceives to be healthy - an example being how most international health food chains have had to 'Indianise' their menus to suit the nation's inherent need to satisfy the palate first. ITC's plan, therefore, is not to veer away from health, but to focus more on taste which is key to the Indian palate. "Unbranded juices are popular despite hygiene concerns of the glasses they are served in, etc, simply because of how delectable they are," says Jayaraman. "No one in this category has spoken of the visceral reasons to have juice, which is where B Natural steps in." Grey has chosen a fundamental truth as its communication insight: that when you have something delicious, it shows on your face. The agency then wanted to show expressionless archetypes - people with deadpan faces - responding naturally to this juice. A smart strategy to blaze its own trail away from category leaders? "ITC's usual tactic, when it enters a new category, is to take on a basic category benefit to begin with," says Anustup Datta, director, brand and business strategy, Vertebrand Management Consulting. It doesn't look for layered benefits. Experts do, however, suggest that another key area which the brand could target in its next communication could be specifically wooing the youth. Branded fruit juices are seen to be serious, only for those who are health conscious, implying those who are 30-plus, perhaps. The youth, typically, have taken to colas, fruit drinks, etc. The branded juice category needs to be, therefore, repositioned, if it is to appeal to youth, advises Datta. The juices market as a whole is growing at about 15-20 per annum, led by a growing population of health conscious consumers. As the market isn't cluttered with too much competition - given the fact that it is dominated by only two players - ITC has gone the whole hog with 'desi' flavours to do the trick of expanding the market. These flavours are called Mixed Fruit Merry, Guava Gush, Litchi Luscious, Orange Oomph, Mango Magic, Pineapple Poise and Jamun Joy - clearly an appeal to suit the local Indian palate. What analysts are waiting to see is whether ITC's maiden attempt at branded juices proves to be a strategic move to grow its share in the overall food and beverages segment.